A Seattle resident has tested positive for West Nile virus, making this the first locally acquired case of West Nile virus reported in King County. The individual, a woman in her 40s, reported symptoms including fever, headache, stiffness in the neck, and a rash. She was hospitalized for one day in mid-September and has since recovered. She was most likely infected in late August in Seattle but possibly could have been infected on a day-trip to Bainbridge Island. Prior to this case, all reported cases of West Nile virus infection to King County residents had a history of travel either out of Washington state or to eastern Washington, where approximately six people have become infected each year over the past ten years. 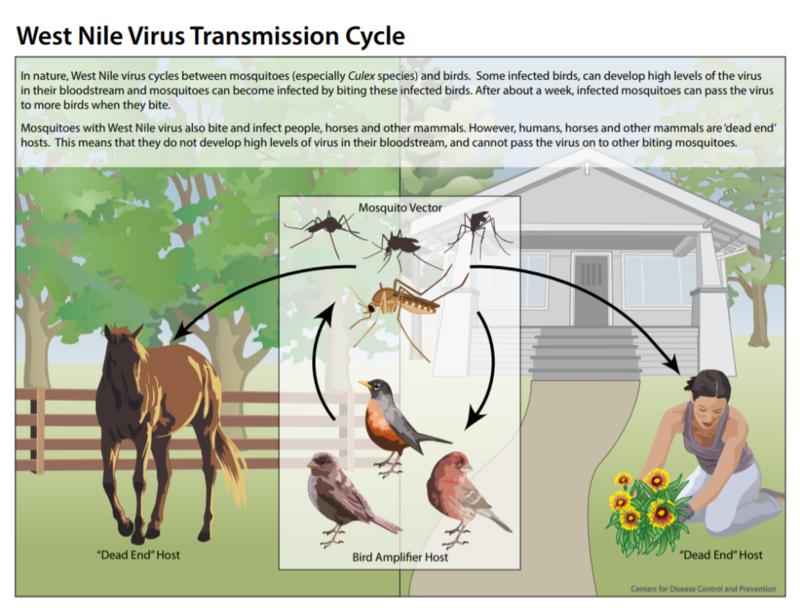 West Nile virus is most commonly transmitted to people, horses, and some types of birds by the bite of an infected mosquito. 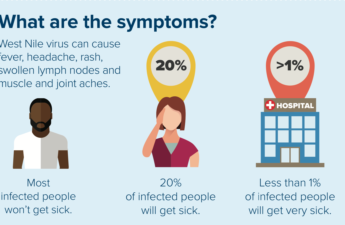 Most people who become infected don’t become ill. About 1 in 5 people with West Nile virus experience symptoms including fever, body aches, fatigue, headache, rash, vomiting, diarrhea, or joint pain. Less than 1% develop more serious disease, in which the brain or the membrane covering the brain and spinal cord become inflamed and result in high fever, headache, neck stiffness, disorientation, tremors or convulsions, vision loss, muscle weakness or paralysis, and coma. Rarely, in severe cases, West Nile virus can be fatal or leave long-term symptoms or disabilities. The best way to prevent West Nile virus infection is to avoid mosquito bites. The species of mosquito that carries West Nile virus is most likely to bite between dusk and dawn, so be sure to wear long sleeves, long pants, and socks and use insect repellentwhen outside during these times. Repellents that are registered with the EPA, such as one containing DEET or picaridin, are known to be very effective. The mosquitoes will also bite during sleep, so make sure to have screens in good repair on all windows, doors and sliders that are left open. Mosquitoes like to lay their eggs in still or standing water. Once laid, mosquito eggs hatch into larvae and develop into adults in about two weeks in warm weather. Some species need only a few ounces of water to lay eggs. In King County, larvae tend to hatch starting in March and through October. At one time, Public Health–Seattle & King County conducted active surveillance for West Nile virus in both birds and mosquitoes. Detection in these species was intended to provide an early warning of the risk of human cases. Due to budget cuts, surveillance for the virus in mosquitoes was ended in King County in 2009, and dead bird surveillance was ended statewide in 2016. Public Health – Seattle & King County will continue to track any reported cases of West Nile virus and work with the Washington State Department of Health on plans for monitoring West Nile virus. For more information, visit Public Health’s West Nile virus page. Why is eradicating polio so hard?